Tennis Canada announced on Wednesday that Eugenie Bouchard is the winner of the 2018 Excellence Awards in the Female Player of the Year and Singles Player of the Year categories. In addition, Gabriela Dabrowski has been named Doubles Player of the Year, while Rebecca Marino is the Most Improved Player and Leylah Annie Fernandez is the Junior Player of the Year. Bouchard takes this honour for the fifth time in six years. During the 2018 season, she saw a significant progression which allowed her to finish the year ranked no. 88. She also finished her year on a high note by reaching the semi-finals of a tournament in Luxembourg after having to go through qualifying. Earlier this year, she reached the semi-finals of a tournament in Gstaad and also won all three of her qualifying matches as well as her first round match at Wimbledon and the US Open. The Quebec native, who slid to the 194th spot in the rankings in June, was able to regain her place in the Top 100 and was thus able to secure her participation in the main draw at the Australian Open. With her ranking of no. 10, Dabrowski is the country’s best doubles player and one of the stars of this field on the WTA tour. In January, she won her second Grand Slam title when she was crowned mixed doubles champion at the Australian Open playing alongside Mate Pavic. She added three WTA titles to her collection, at tournaments in Sydney, Eastbourne and Doha. She finished her exceptional season in style by qualifying for the end of year WTA Finals along with her partner Yifan Xu. 2018 was a momentous year for Rebecca Marino who made a return to competition after an absence of over five years. The 28-year-old began the season without a ranking and finished the year ranked inside the Top 200, currently sitting at no. 189. She was notably crowned champion of five tournaments on the ITF Circuit, three of which were the first events in her comeback. Towards the end of the year, she reached the quarter-finals at the National Bank Cup in Quebec City. For her part, Fernandez, had success both on the junior and professional circuits in 2018. In fact, in addition to reaching the semi-finals at the Junior French Open as well as no. 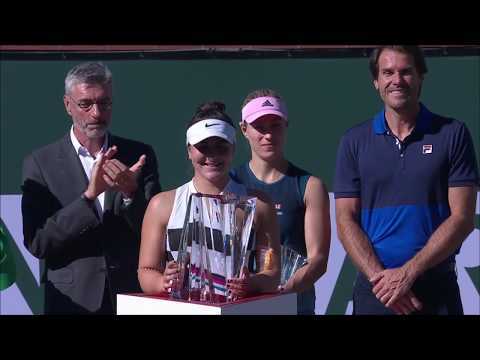 11 in the ITF junior rankings, the 16-year-old athlete also notched her first victory in the main draw of a WTA tournament by defeating compatriot Gabriela Dabrowski at the National Bank Cup. The Tennis Canada Excellence Awards are selected by a committee comprised of high-ranked Tennis Canada personnel and the country’s top national coaches. Founded in 1890, Tennis Canada is a non-profit, national sport association with a mission to lead the growth of tennis in Canada and a vision to become a world-leading tennis nation. We value teamwork, passion, integrity, innovation and excellence. Tennis Canada owns and operates the premier Rogers Cup presented by National Bank WTA and ATP World Tour events, 9 professional ITF sanctioned events and financially supports 13 other professional tournaments in Canada. Tennis Canada operates junior national training centres/programs in Toronto, Montreal, Vancouver and Calgary. Tennis Canada is a proud member of the International Tennis Federation, the Canadian Olympic Committee, the Canadian Paralympic Committee and the International Wheelchair Tennis Association, and serves to administer, sponsor and select the teams for Davis Cup, Fed Cup, the Olympic and Paralympic Games and all wheelchair, junior and senior national teams. Tennis Canada invests its surplus into tennis development. For more information on Tennis Canada please visit our Web site at: www.tenniscanada.com and follow us on Facebook and Twitter.